Know thy documents! 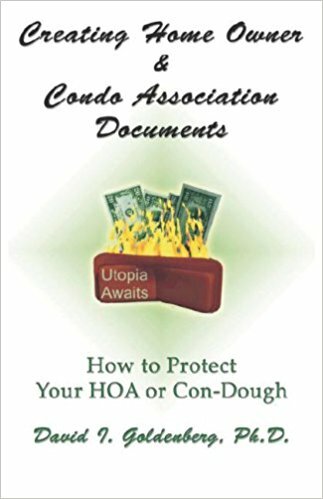 The best way to put an end to unnecessary, irritating and costly homeowner association disputes is to modify and correct underlying HOA documents. But most condo owners have little idea how to read, let alone change or protect their original documents. This work provides detailed condo and HOA document templates that can help protect your homeowner association civil rights, while putting a stop to arbitrary or retaliatory fines, liens and foreclosures. Discover what excellent homeowners association documents should look like and how they should be written. The book was adopted by a developer based in the Northwest as an “enlightened” document template for a new community. The condo and HOA document templates presented by the author will help you defend your HOA rights. The book offers a new approach for resolving the intense problems that arise from HOAs and preventing their occurrence in newly formed communities. If you are not happy with your existing documents and/or are urgently seeing the best language to revise them, you must have this book. Reduce legal costs with ready-made templates that can be quickly adopted or presented to your attorney for final review.